Depraved and Insulting English. Peter Novobatzky and Ammon Shea, 2001. This is one of those books that I wish I could pour directly into my brain, but due to its slightly cumbersome dictionary-style format, it seems almost impossible to shove so many useful words into one’s vocabulary without group study sessions. If you have the desire to arrange one, however, please invite me! 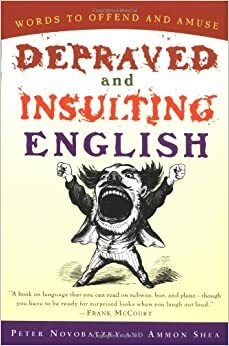 A warning: if you are sensitive to uncritical sexism, ableism, homophobia, or transphobia, you may want to steer clear of this book: it certainly keeps its promise to “offend.” The words I have compiled here don’t, as far as I can tell, fall into any of these categories, so this post should be safe! I am so happy to have found the word “gound,” since my linguist friend and I were recently talking about geographical preferences for the name of that substance, and had no idea what it was actually called! Previous Give Hamlet another chance!